The Honda CBR650R's bookings can now be done from any of the 22 Wing World outlets across India at just ₹15,000. The icing on the cake is that Honda will price this new bike under ₹8 lakh, in the same region as the CBR650F which it replaces. These are exciting times in the motorcycle world in India as Honda Motorcycle & Scooter India Pvt Ltd announced that the bookings are now open for the new CBR650R, which was showcased last year at the 2018 EICMA Show in Milan. The bookings can now be done from any of the 22 Wing World outlets across India at just ₹15,000. The icing on the cake is that Honda will price the CBR650R under ₹8 lakh, in the same region as the CBR650F which it replaces. 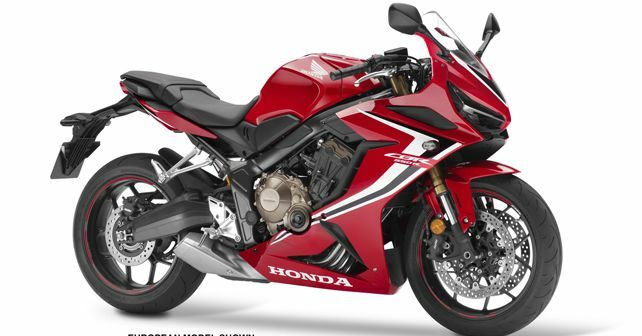 Honda has managed to do this as the CBR650R will take the CKD route into the Indian market. The CBR650R looks a lot more aggressive than the outgoing model as its styling is inspired by the Fireblade. Apart from the sharp lines, the new motorcycle now comes with all new dual LED headlights and a digital LCD display. The CBR650R has also lost some weight, 6 kilogrammes to be exact, thanks to the lighter steel diamond frame. The five Y-shaped spokes aluminium wheels reduce weight by 0.4kg and 0.5kg front and rear respectively. It also comes equipped with 41mm inverted Showa Separate Function front Fork (SFF). Adjustable for seven-stage spring preload, the single-tube shock operates directly on the curvaceous gravity die-cast aluminium swingarm. The new CBR650R is powered by the same midsized four-cylinder 649cc, DOHC 16-valve engine, which now churns out 5% more power above 10,000 rpm, with redline raised by 1,000 rpm. The power output is 92.5bhp at 12,000rpm and torque of 64Nm at 8,500rpm. It is fully loaded with features like Slipper Clutch, dual-channel ABS and Honda Selectable Torque Control (HSTV), which manages rear-wheel traction, and it can be turned off should the rider choose. The CBR650R will be available in two colours - Grand Prix Red & Gunpowder Black Metallic.